Dé hAoine, 17 Samhain 2017, thaisteal Daniel ó 3 Aoife chuig Leabharlann Náisiúnta na hÉireann chun páirt a ghlacadh sa bhabhta leathcheannais den chomórtas filíochta Poetry Aloud. Is comórtas mór filíochta é Poetry Aloud agus chuir beagnach 1,800 scoláirí ó cheann ceann na tíre isteach ar an gcomórtas i mbliana. Anuraidh bhuaigh Daniel an chéad áit in Éirinn sa rannóg sóisearach de Poetry Aloud. Bhí bród ar Daniel páirt a ghlacadh sa bhabhta leathcheannais agus labhair sé go hálainn lena dhá dhán; "St Kevin and the Blackbird" le Séamus Heaney agus "Lines Written on a Seat on the Grand Canal" le Patrick Kavanagh. Bhí an iomaíocht géar ar an lá ach d'éirigh le Daniel áit a bhuaicint sa bhabhta ceannais. Comhghairdeas leat a Daniel! Go n-éirí leat sa bhabhta ceannais ar an 1 Nollaig. On Friday, 17th November 2017, Daniel from 3 Aoife travelled to the National Library of Ireland to compete in the semi-final of the Poetry Aloud poetry competition. Poetry Aloud is a prominent poetry speaking competition and this year almost 1,800 students from all corners of Ireland competed in the competition. Last year Daniel won first place in Ireland in the junior category of Poetry Aloud. Daniel was proud to participate in the semi-final and he performed beautifully with his two poems; "St. Kevin and the Blackbird" by Seámus Heaney and "Lines Written on a Seat on the Grand Canal" by Patrick Kavanagh. The competition was very close on the day but Daniel successfully won a place in the final round. Congratulations Daniel! Best of luck in the final round on December 1st. Dé hAoine, 20 Deireadh Fómhair ghlac scoláirí ó 1 Sadhbh agus 4 Lear páirt sa chéad bhabhta de Thráth na gCeist Ghael Linn i nDún Dealgan. Bhí lá iontach acu ag freagairt ceisteanna agus ag bualadh le scoláirí ó scoileanna eile le suim sa Ghaeilge. Bhí an iomaíocht an-ghéar ach d'éirigh le foireann ó rang Shadhbh an dara áit a bhaint amach. Comhghairdeas mór leis na scoláirí uilig a bhí ar an bhfoireann. Beidh siad ag dul ar aghaidh anois chuig an gcraobh réigiúnda. Go n-éirí leo sa chéad bhabhta eile! An tseachtain roimh an mbriseadh lár-théarma bhí na daltaí ó Rang Shadhbh sa chéad bhliain ag scríobh cártaí poist chuig daltaí sa chéad bhliain i méanscoil sa Fhrainc. Bhain said an-taitneamh as an gcleachtadh sin agus tá siad agus a múinteoir Fraincise, Iníon Ní Dhuinn, ag súil go mór le freagraí a thabhairt ar ais ón scoil sa Fhrainc. Maith sibh Rang Shadhbh. The week before midterm the students from Rang Shadhbh in First Year wrote postcards to 1st year students in a secondary school in France. They really enjoyed the exercise and both the students and their French teacher, Iníon Ní Dhuinn, are really looking forward to receving a response from the school in France. Well done Rang Shadhbh. Chomhghairdeas le scoláirí Rang Lir a fuair torthaí an Teastas Sóisearaigh Dé Céadaoin, 13 Meán Fómhair 2017. 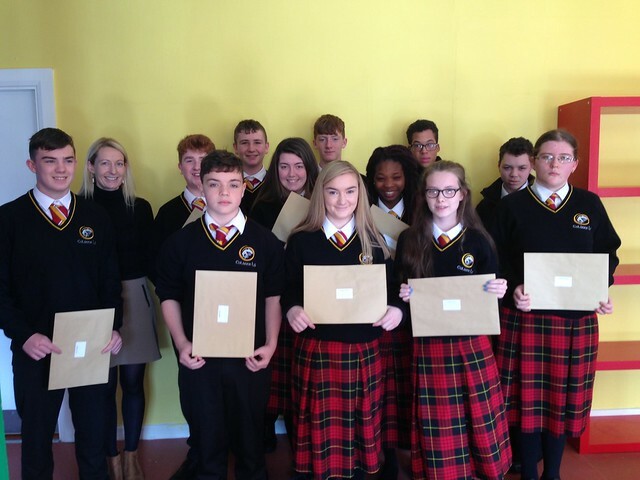 Congratulations to the students of Rang Lir who received their Junior Certificate results on Wednesday, 13th September 2017.